We took a walk through Ft. Tryon park this afternoon. The late day sun was beautiful. 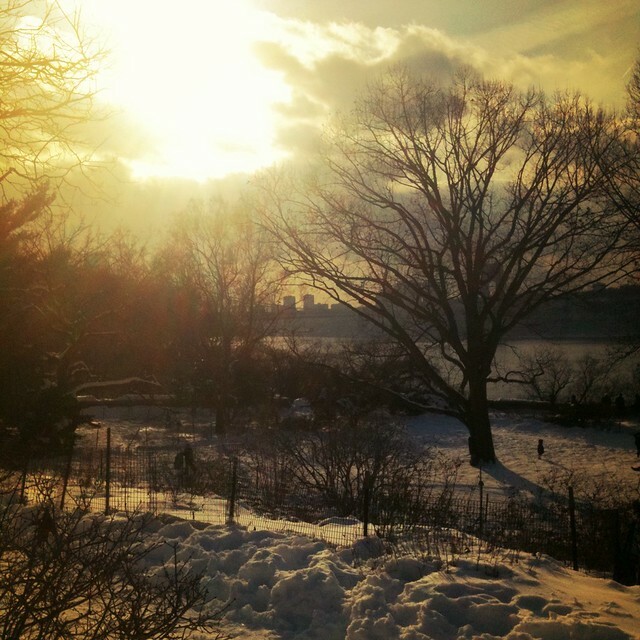 I love how you can barely make out the GWB in the background and the kids sleigh riding down the hill. Oh how gorgeous. It was sunny here in South East England yesterday too, but no snow. What a difference it makes to everything when the light is good! Lovely blog by the way! I agree with Lynne - a bit of sun and I'm smiling and don't mind the cold so much. Makes me feel much more positive about the frost and snow. pretty light! makes the winter seem bearable! it's beautiful. You caught a happy moment of winter! You did catch the sunlight from yesterday perfectly! That's awesome. Wow girl - that is absolutely incredible. this is truly stunning, the light is fantastic. Beautiful and timeless. Lovely catch. Breathtaking! It makes me feel warm and peaceful just lookign at it. This picture is beyond beautiful. I love it so much. We are so glad that you come to Communal Global. What a joy that is! Hello, hope you don't mind me following you. I live in Scotland, never been to New York and absolutely love your pictures! !